Open office lighting with DAISY. 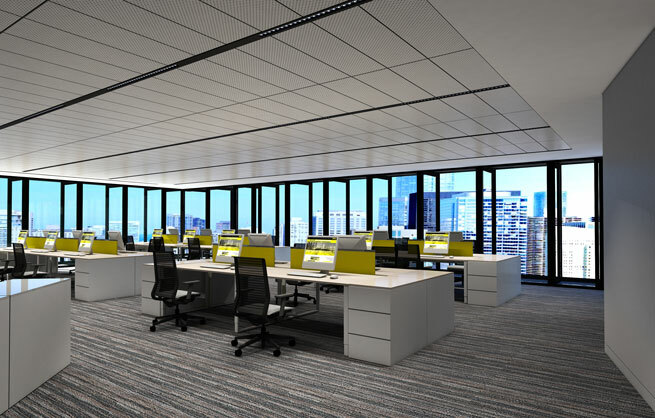 Shows the most common office lighting installation scene upgraded with DAISY optics. Same setup works with surface mounted luminaires as well. Installation is simple, practical and efficient, but using only direct light can leave the ceiling and walls less bright, which is not recommended. In this case large windows and day-light integration helps to keep the room bright. The lack of separate task lights means that the workers eyes can adapt to the whole room lighting levels, which reduces eye fatigue. The information contained herein is the property of LEDiL Oy, Joensuunkatu 13, FI-24100 SALO, Finland and is subject to change without notice. Please visit www.ledil.com for additional information, such as the latest photometric files, 3D mechanical models, and application notes relating to handling, gluing and taping.